Quality of the observations database limits the quality of the correction. 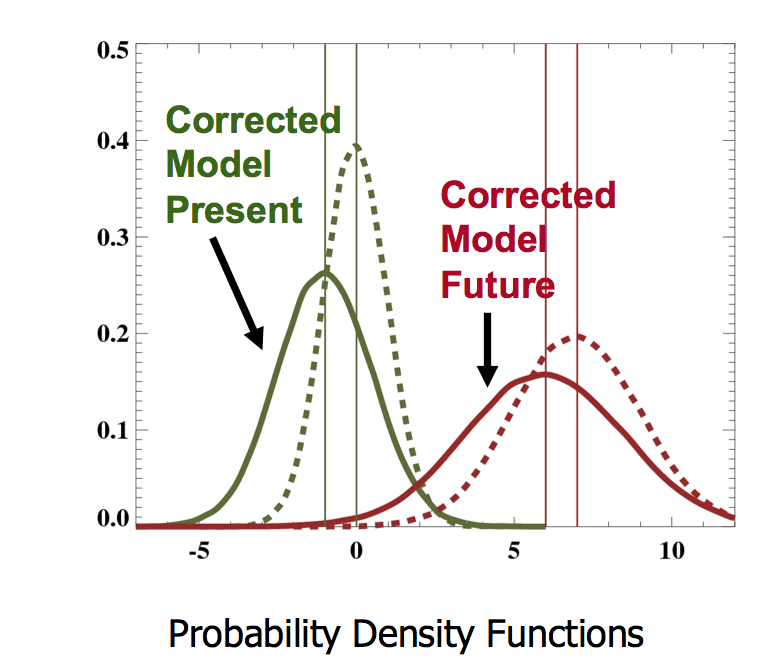 It is assumed that the bias behaviour of the model does not change with time. Limitation: Temporal errors of major circulation systems can not be corrected. Currently, for the correction of climate data that are to serve as input data for impact models (e.g. hydrological or crop models) the Quantile mapping approach or some variant of it is perhaps the most widely accepted. All these methods can also be applied to seasonal forecasts, with the provision that biases are not only a function of time-of-year, but also a function of leadtime. Beware that the concept of biascorrection is not undisputed (see the Ehret (2012) paper below). Apart from the contentious issues surrounding bias correction, some researchers would argue that bias correction is distinct from using change factor ("delta change") methods (e.g. Hawkins et al., 2013, Agric. For. Meteorol., 170, 19-31). Even though they may produce identical results in certain idealized situations, bias correction would not normally be expected to replicate the baseline climate perfectly, so cannot offer a faithful substitute (for all variables and time resolutions) for real observations to represent the present climate. That faithful representation is sometimes required in impact applications. on the other hand, change factors apply the baseline climate but cannot normally be expected to provide information on future changes in high frequency variability. that information can be critical for some other impact applications (e.g. estimates of peak discharge in hydrological catchments). Hagemann, S., Chen, C., Haerter, J. O., Heinke, J., Gerten, D., and Piani, C.: Impact of a statistical bias correction on the projected hydrological changes obtained from three GCMs and two hydrology models, J. Hydrometeorol., 12, 556–578, doi:10.1175/2011jhm1336.1, 2011.